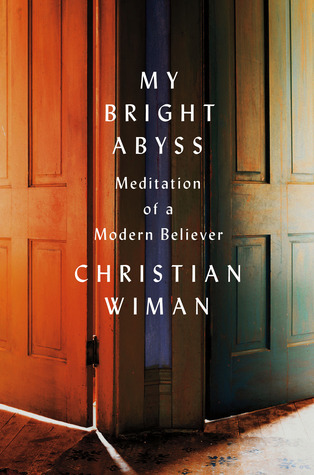 My Bright Abyss, the latest book from poet Christian Wiman, came to me at the right moment; it was one of those inspired books that reaches you in this unexpected, perfect place. Lately, I have been feeling lonely in my faith. The old structures of belief that I once clung to have crumbled, noiselessly and painlessly, but I still miss them. I want to return to the simpler days of my childhood and youth, the time of legalistic, black-and-white belief; it was easier back there. I was comfortable pretending I had all of the answers. In fact, there is no way to “return to the faith of your childhood,” not really, unless you’ve just woken up from a decades-long and absolutely literal coma. Faith is not some half-remembered country into which you come like a long-exiled king, dispensing the old wisdom, casting out the radical, insurrectionist aspects of yourself by which you’d been betrayed. No. Life is not an error, even when it is. That is to say, whatever faith you emerge with at the end of your life is going to be not simply affected by that life but intimately dependent upon it, for faith in God is, in the deepest sense, faith in life–which means that even the staunchest life of faith is a life of great change. It follows that if you believe at fifty what you believed at fifteen, then you have not lived–or have denied the reality of your life. I feel very unburdened by this. Acknowledging that I don’t worry about these subjects anymore has been so freeing to me. I don’t have to have a stance on heaven or predestination; I don’t have to determine (with outrageous arrogance, I might add) whether someone is “saved” or not. My lack of concern over these issues does not affect my relationship with people or with Jesus. Rather, I feel so much happier about being a Christian than I did six or seven years ago. Many of you may disagree with this laissez faire attitude toward certain elements of doctrine; that’s OK. I’m just finally willing to admit that I don’t know everything and that I don’t need to know everything. The minute any human or human institution arrogates to itself a singular knowledge of God, there comes into that knowledge a kind of strychnine pride, and it is as if the most animated and vital creature were instantaneously transformed into a corpse. Any belief that does not recognize and adapt to its own erosions rots from within. Only when doctrine itself is understood to be provisional does doctrine begin to take on a more than provisional significance. Truth inheres not in doctrine itself, but in the spirit with which it is engaged, for the spirit of God is always seeking and creating new forms. So, God has not changed; I have changed, and with that, my views on the essentials truths of my faith have changed. Christian Wiman reminded me that this is OK, and that I can find peace here, in this new and unfamiliar landscape of personal belief. The book draws its title from a few lines of poetry by Wiman, which have struck me as the precise rendering of all that I have been feeling and wrestling with over the past year. Buy My Bright Abyss on Amazon. New Yorker review of My Bright Abyss. it’s a good thing we can’t return to the faith of our childhood. i hope i’ve grown up, even a little bit. thanks for the wiman recommendation!